So I recently stumbled upon a new addictive trilogy that I just had to share. I was actually scrolling through IMDB looking for a new movie to watch when I came across a German title called Rubinrot. Once I did a little googling I found out it was based on the first book of the Edelstein trilogy by Kerstin Gier. Luckily the first two books (with the third coming out this fall) were translated into English (by Anthea Bell). I’m hoping the books will be picked up for a film in English because it would be a great story to watch. So here’s the run down of Ruby Red! Now here’s the Likes, Dislikes, and Gotta Know Info! I wasn’t exactly sure how much I would end up loving this story when I decided to read it. Time-traveling stories never really piqued let alone kept my interest. 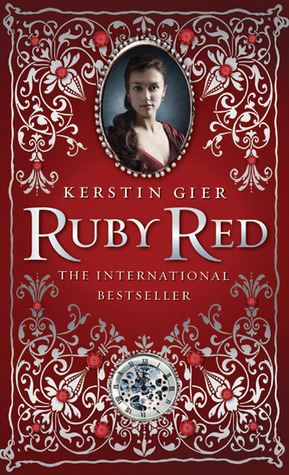 However what kept me reading with Ruby Red was the mystery and the main character. Most time-traveling stories have some puzzle that needs solving, but this mystery was in the middle of a wonderfully believable world that Geir created. Set in London, England, Gwen is a somewhat regular girl growing up trying to bare her family’s oddities. They have a secret gene passed down to certain females in the family that allows them to time travel. This isn’t by a device that’s created, but an ability in their blood. The hard-part: they can’t control when they time travel without a device. What’s more weird is that there is a prophecy along with it all. Cue in Gideon the second half of this puzzle. His family has a connection with Gwen’s over multiple generations. Both families have learned to deal with this gene and have tried to some how complete the prophecy. But Gwen wasn’t supposed to be the last time-traveler, her cousin Charlotte was. Unprepared and confused, Gwen is quickly thrust into her family’s secrets and past worlds. Soon she finds her self falling for Gideon, trying to survive surprise attacks in the past and wondering how to keep her ability to see ghosts a secret. Luckily her best friend Lesley is right alongside her trying to make sense of it all and helping her figure out who to trust and who is actually dangerous. Clearly, this story could become cliche real fast. However, Geir’s writing was superb. She made this time traveling world come alive–allowing me to believe a lot of research when into writing it. When there’s reach involved, it shows the author really cared in making this story as accurate and as real as possible which keeps me as a reader interested and thankful. So many stories lack accuracy which can kill the believable factor for a reader. Aside from the setting, Gier also created an interesting villain. Gier sets up two possible evils, but the reader gets a somewhat clear idea of who the real villain is of this story by the end of the first book. What is left a mystery is how many people are helping the real villain and just like Gwen, readers are left questioning who to trust. A small problem that I had was how quickly Gideon turned his attention to Gwen. I’m always a realist when it comes to how quickly characters fall-in-love with each other. However, by the second book their relationship develops on a more realistic level and certain things are explained to help make their relationship for me more believable. The end of the first book left me craving more and I instantly got my hands on book two. If this story gains more popularity, I can see it being as hot off the shelves as The Mortal Instruments or even The Hunger Games. If you’re in the mood for a story filled with adventure, some humor, romance, and a little mystery than pick up this story right away. It’s a definite recommend from me! Have you read Ruby Red? What are your thoughts on Gideon and Gwen? What about the villain? Will the prophecy bring out something good or evil? Let us know your thoughts in the comments below! Tweet us @PopCrunchBoom as well! Stay tuned for my review of Sapphire Blue, Book 2 of the series!! Check out the series website and find clips of the movie in English on Youtube!